I love summer for so many reasons. One of my favorite summer things is fresh vegetables. Garden vegetables are absolutely delicious and I love cooking and baking with every single one of the them. In our area zucchini and summer squash seem to grow easier than anything else and I am always swimming in both of them for a good part of the summer months. I have learned to make great tasting brownies, cakes, bread and muffins that my kids love and they have never guessed that they contain garden vegetables. However, as much as I love baked goods I am trying to reduce the amount that my family consumes. So this time when I had a number of zucchini I decided to look for new savory and healthy options. 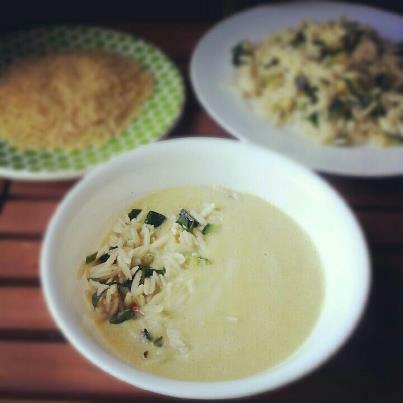 I found a recipe from Everyday Food magazine for Corn Chowder with Zucchini and Orzo, which looked simple, low in fat and delicious. This recipe has 7 ingredients. It takes 30 minutes of total time, 20 minutes of which is active and makes 4 servings. All the ingredients were easy to find at my local grocery store and I made no substitutions. I did find that I had to let my chowder cook for slightly longer than the 8 minutes suggested by the recipe. At 8 minutes it hadn't thickened well so I allowed it to cook an additional 5 minutes. Be very careful when using the blender with the hot soup. I always place a towel over the top opening in addition to the plastic lid insert. I have had soup splatter more than once and the towel prevents anything from leaking out the top. Another option would be to use an immersion blender. It would work just as well and you wouldn't have to worry about pouring hot liquids. I followed the remainder of the recipe as written. With 8 grams of fat and 9 grams of protein per serving this recipe is a great, light summer dinner option. I loved how sweet the chowder was and the zucchini and orzo on top was not only pretty on the plate, but created a nice texture difference. My husband wasn't as big of a fan of this recipe. He thought that the chowder would be great as a breakfast porridge, but not as a dinner option. My two kids loved it though, so he was the odd one out. Overall, this recipe was a great way to use garden veggies and I would use it again next summer. Everyday Food currently does not have this recipe online. However, it can be found in the July/August issue or here is a link to a modified version. This looks like heaven right now. I'm your newest follower, found you thru Mom's Monday Mingle. I think I'll be checking you out again when I begin menu planning. I'm horrible in the kitchen but willing to learn. Cooking and baking are easy to learn I promise :) Followed you back, have a great weekend! I already follow you :) Come back again soon! Followed you back :) Have a great weekend! This looks so good! I have the recipe saved! I can't wait to make it. Thanks for linking up with Wednesday Walkabout! That looks gorgeous! Thanks for linking up at Meatless Monday!!!! You're welcome! This looks so good, I just had to share on Meatless Monday today, take a look! : http://jessica-healthymommyhealthybaby.blogspot.com/2012/09/its-meatless-monday-but-im-taking-break.html. Thanks for sharing my recipe :) Sorry it took me a while to respond, it has been a crazy couple of weeks! This soup looks and sounds fantastic. I love making soups so I will have to try this out one day. I love soup also, especially with the cold weather we have been having :) Going to follow you back!